Android is a Linux-based operating system designed for touchscreen mobile devices; such as smartphones and tablet computers. Android is based on Linux and offers you a great deal of customization and millions of apps.One of best application is android chat application by which you can easily interact with your dear one's.I am sharing with you free chat applications which have fast chatting performance.Following are top 10 free android chat applications. Imo messanger provides fast chatting environment by which you can make high quality voice calls.You can attach files video files and start group chat to stay in touch with your family and friends.This android app support G talk,FB chat,Skype,MSN, yahoo messenger etc. WhatsApp is one of the most popular instant messaging app for Android devices. It’s available for BlackBerry, Android, iPhone, Windows Phone & Nokia Phones too. You can send unlimited number of chat messages to your friends with WhatsApp. Trillian is a chat app for android which enable you to send instant messages and facebook message to your familu and friends. 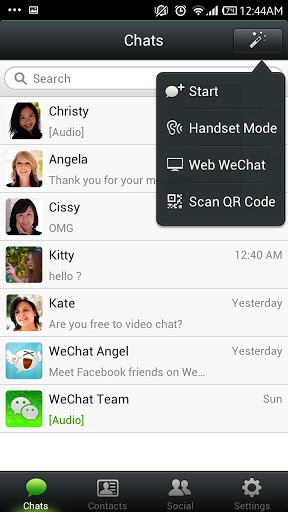 Tango is the best way to video chat with your buddies, Android or iPhone, over 3G, 4G or Wi-Fi. Free.Its contact system works as WhatsApp, means Tango automatically finds its users from your contact list and connect it with you. Line android chat app enables you to send free messages and calls all over the world.Its performance is so super that it is accessed by 94 million users. We chat is power full chat app for android.It is available in 18 different languages.It is global software which allows you free HD video calls,voice calls,text messages. Skype enables you to send free IM and video calls all over the world. Skype performance is very well than other communication softwares.Voice and video chat is free using skype while if you want to call on Landline number or mobile then you have to pay as per skype rates. Ebuddy messanger most popular android chat software.It supports various chat services such as Orkut, MSN, Facebook, Yahoo, AIM, ICQ, GTalk, MySpace & Hyves. Just you need to create one ebuddy ID. It has with cool avatar settings and built-in emotions and smileys. It is an android chat app which enable you to send unlimited messages,voice chat and videos calls to your friends.you can also chat with your facebook friends and can share files and videos on your android phone.